The Resource Directory is a searchable directory of 8,5OO+ websites of interest to Youth Pastors and others wanting to do Bible research and research on Christian topics and social issues. The search boxes below will link you with the on-line Bible Study Tools Library. You will be able to use (for free) a variety of Christian Bible study tools designed to help you learn and grow in your knowledge of the Bible and the wonderful truths God wants you to know and apply in your life. For example, you will be able to look up words or phrases and quickly find all the Bible passages that contain them. You can also insert a Bible book, chapter and verse reference and view it in your choice of more than a dozen different Bible translations. You can search to find information on topics found in the Bible or other reference works of interest to Christians. For those wanting to research original languages, there are Greek and Hebrew tools available to you. � Tools for those wanting to research the Greek and Hebrew Bible text to find the exact meaning and usage of the original words penned by the Bible writers as God inspired them. available and promoting their use. 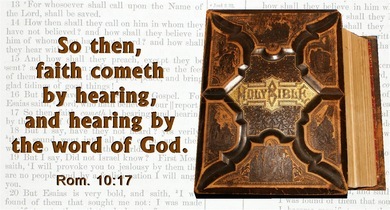 Listen to the Bible from Genesis to Revelation via Real Audio!